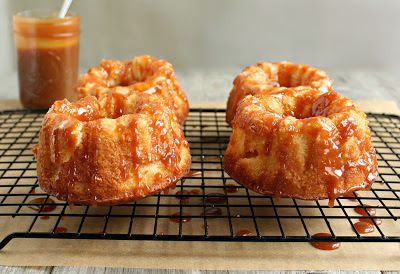 As you all know, the bundt bakers group has a different theme each month and July's was caramel. When our group founders, Anuradha of Baker Street and Lora of Cake Duchess, announced it, my first thought was that apples go well with caramel and my second thought was that I don't know how to make caramel. I knew it involved sugar and heavy cream and butter and violent looking bubbling in a pot. I flashed back to all those Challenge shows on Food Network where they try to make sugar sculptures and the announcers warn that a hot sugar burn is incapacitating. Um...maybe I'll sit this month out? But then I realized that I cook sugar all the time when I make simple syrup for drinks and it's not scary at all. Plus, I don't easily walk away from a challenge. So, I made the apple bundt cakes (minis this time) and gathered all the ingredients for the caramel. Some recipes call for lots of butter, some for only a little. I read that it doesn't matter as long as you have a good fat to sugar ratio and the fat can come from either the cream or the butter. I cooked the sugar, removed it from the heat, poured in the cream, got the expected violent bubbling, stirred it and...it seized up! Damn! I had a pool of runny liquid and a large, solid mass floating in the middle of it. What now? Going on instinct alone, I put it back on the stove, on a very low heat, and stirred like mad for quite a long time. It was working, though, and the solid mass was getting smaller and smaller. I did add a tablespoon of butter just to give it a good glossy finish, the way I do with savory sauces, and a good hit of sea salt since salted caramel is much better than regular caramel. And...I had caramel! Really, really tasty caramel. Much better than anything I'd ever tasted from a jar. Later, I researched where I'd gone wrong and found that my cream was much too cold compared to the sugar. The temperature difference caused the seize and, in future, I should heat my cream. So, learn from my mistake, heat your cream and make this sauce. Pour it over this cake or any other cake or on ice cream or just grab a big spoon because this stuff is goooood. Enjoy! Add the eggs and sugar to a large bowl and beat together until creamed. Beat in the vanilla and the butter followed by the sour cream. Sift together the flour, baking powder and salt and slowly beat into the batter. Gently fold in the apple pieces. Butter and flour 6 mini bundt pans and divide the batter equally into each. Bake in a pre-heated 350 degree oven for 45 minutes or until a cake tester comes out clean. Allow to cool before removing the cakes from the pans. Make the sauce by melting the sugar in a pot over a low to medium flame. Do not stir. When the sugar has completely dissolved, remove it from the heat and add the heavy cream. The mixture will bubble up. Return to a low heat and stir vigorously until all lumps are gone and the sauce is a light golden brown. Finish with the butter and sea salt and remove from the heat. 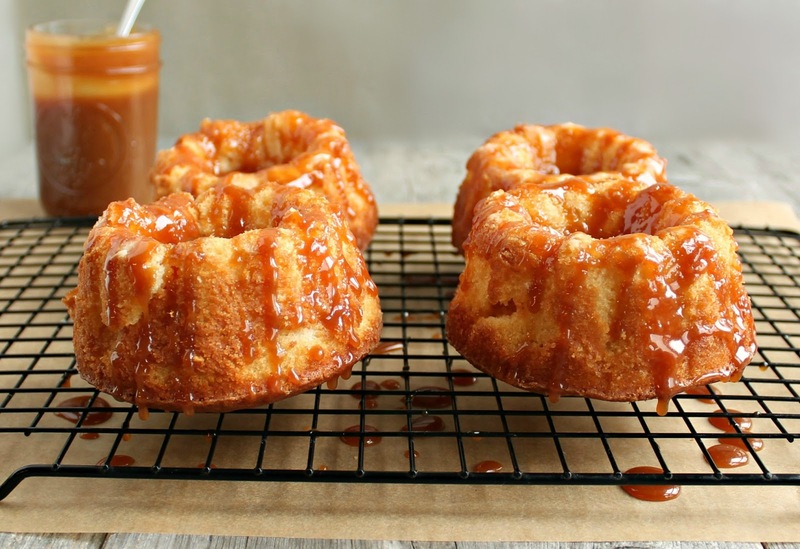 When the cakes have cooled, pour the caramel sauce over each cake and serve the remainder on the side. This recipe makes 6 mini bundt cakes but may be doubled to make one, 12 cup, bundt. These seriously had me drooling...You could have an apple bundt cake for breakfast, right? Dang! Is that why my caramel seizes? That's why I never do it...because of that one time I made it and it was a disaster. Salted caramel, enough said. YUM! *jaw drops* ....you had me at salted caramel! So glad you made caramel - homemade is so much better than any from the store! I don't typically heat my cream when I'm making caramel sauce and don't have an issue. I skip it because it's one more step and one more dish. I have yet to tackle caramel, I've been too scared! These look seriously amazing Anita! 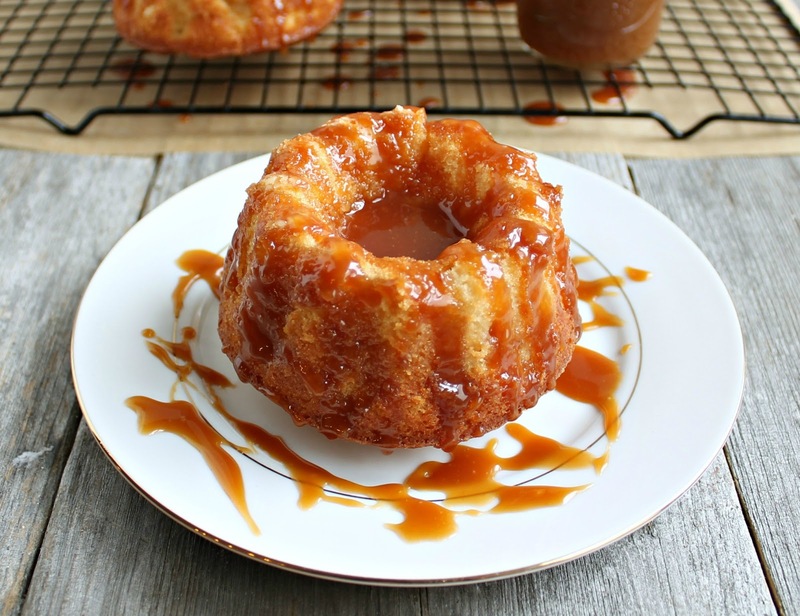 Love these little bundts.. That sauce sounds like the star of the show! Way to tackle caramel, Anita - you totally owned it! These little mini bundts look divine. I wish I had a dozen in front of me right now! Thanks for the lesson with the caramel. . I wanted to try something using no heavy cream and although it was tasty, I don't like the color. . yours looks fabulous! yum! Thank goodness you hung in there with the caramel, these look crazy good. Thanks for the tip about warming the cream. I always love when it's bundtamonth day on the blogs! We are huge bundt cake fans in our family and apple caramel will one I will make for Mr. Picky Eater because that's one of the combos he loves. Your caramel looks great, even with the bumps you had along the way I am glad you kept going! I have a lot to learn about caramel too and now am hungry and ready to give it a second try. You made such lovely mini bundts! 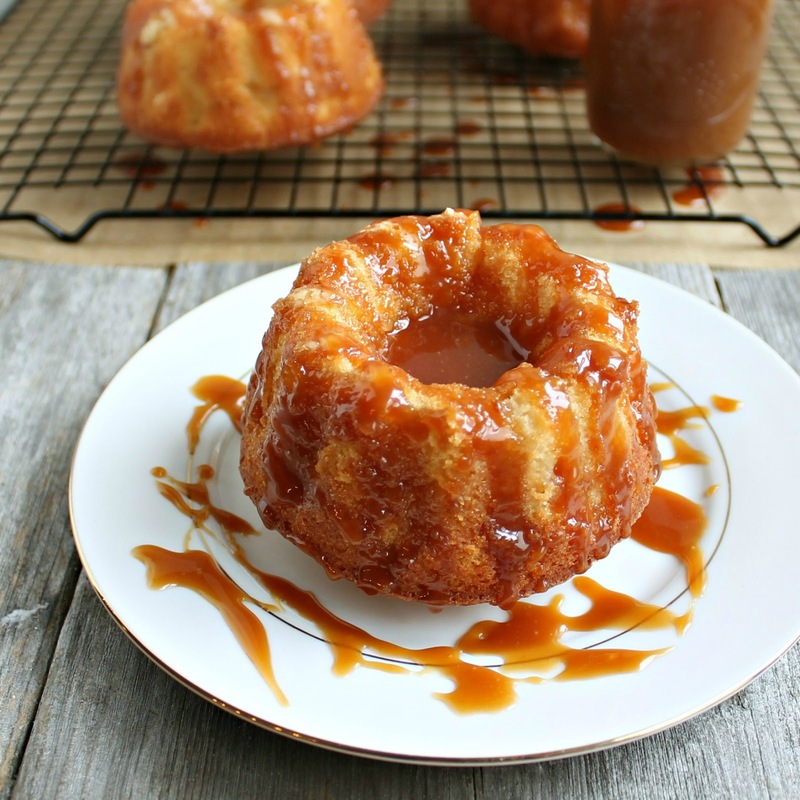 Those are gorgeous little apple Bundts but I especially love the caramel lesson. I don't know how I have avoided making the same mistake myself. Maybe I measure out my cream ahead and, unbeknownst to me, it warms up a little, saving me from my ignorant self? Anyhoo, now we know! And I thank you. Making caramel always scares me too but I certainly love it. Your cakes look amazing and I adore the mini versions. Great step up to the challenge! Apples and caramel in a cake, it doesn´t get much better! Some recipes call for heated cream to avoid seizing, but it´s no big deal, return it to the stove for a few minutes. I love your bundt! Caramel and apples are a great combination. My first attempt at caramel was a total disaster. I cooked the sugar too long before adding the cream and it tasted burnt. The next time I made it, it came out right and I totally agree that homemade is much, much better than store-bought. And caramel goes so well with apples. I'd love to have one of your little bundt cakes right now. Caramel and apples, I cannot think of a better combination! These little bundts sounds so delectable. Lovely little Bundts, they look delicious. WOW! that looks absolutely delicious! I love salty caramel.